Covering the walls with scarlet emulsion might not be to everyone's taste but an easier and less extreme way to inject some warming colour into the home is with furniture and accessories in rich red tones. With autumn just around the corner, let Furniture 123 show you red in three gloriously different styles. 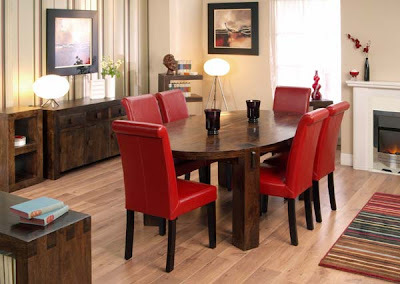 The Cube Oval Dining Set with Leather Chairs encompasses simple practicality with rugged good looks to provide furniture that is functional and good looking. This oval shaped table is made from solid mango wood with a deep walnut colour and bees wax finish. The six chairs are upholstered in rich leather and are available in four warm colours, including this striking red. A large range of matching Cube furniture is also available to help make a bold statement in any room. Clarendon is a traditional leather Chesterfield range that will add an air of traditional grandeur and elegance to any home. 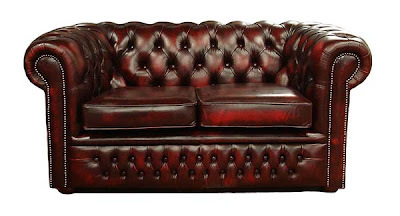 Based on the most popular of the deep-buttoned designs, with traditional straight scrolled arms and low back, the Clarendon Leather 2 Seater Sofa is a true Chesterfield classic. It is available in five ‘antique finish’ leathers but the red version is a real favourite thanks to the warmth and richness it exudes. It is also made to order in the UK. New additions to your home don’t always have to be extravagant. 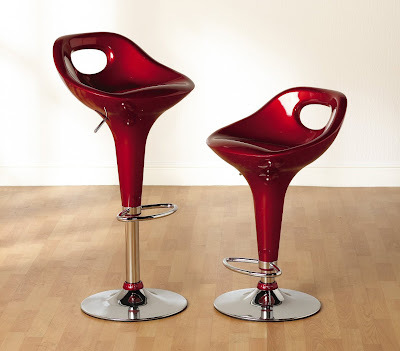 These inexpensive bar chairs come in a pair and their curvy seats in glossy red will instantly update your kitchen. As well as being ergonomically designed for maximum comfort, the Miami Bar Chairs also has a gas lift function, swivelling seat and a handy foot rest, all atop a gleaming metal base.